You’re a hardworking business owner who has prepared for possible expansion, as in knocking down the walls to add further office space, as this is part of managing a business well. But when it comes to making decisions regarding the required software and hardware upgrades, the type of Computer Network as well as internal storage that you need, it’s a good idea to choose products which will leave you room for growth. Generally, were discussing physical servers, such as those rack-mountable models with the mega hard drive, which stores all of your delicate business data and supports all of the applications. As your business grows, you have the option of adding more servers directly to your data center, which should be a temperature-controlled dedicated computer room. It should be able to accommodate for increased storage needs, such as higher and faster performing hardware, as well as preparing for any upsurges in data sharing. The primary purpose of a virtual private network or VPN firewall is that you’re remotely able to protect your computers which are associated with your business’ network server, from any potentially malicious outside attacks such as spyware, malware and other online virtual infections. 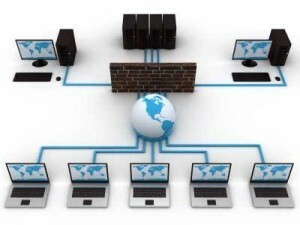 A VPN firewall router is able to put a barrier between all of your connected network computers and the VPN server which is directly connected to the Internet. This way, you or your employees are able to safely and securely access the servers. A standard grade VPN firewall will usually feature secure VPN tunneling, which maintains business data confidentiality, along with remote management capabilities and intrusion protection. What a Gigabit Ethernet switch does is it will connect multiple computers or multiple devices on a local-area network or LAN, which forwards as well as filters “packets” of secured business data among all of the devices. The advantage of using an Ethernet switch, compared to say using just a traditional hub is that it’s able to transmit secure data a lot more efficiently since it’s able to determine the data’s exact intended destination while preventing data collisions. This will enable all of the traffic on a dedicated network to be able to travel a lot more quickly, which will help in preventing any drops in productivity in an expanding business. If your expanding business happens to need more than just a handful of registered copies of a certain software program or application suite, you’re able to take full advantage of bulk volume software licensing, so you’ll get the most bang for your buck. Purchasing a few extra licenses beforehand for this purpose will not usually be that expense while giving your business room for expansion. What switches or hubs do is that they will pass network information along to all of the connected network computers. A router on the other hand is a hardware device which is a little more advanced, which will send network information directly where it needs to go. For instance, a router is able to deliver a downloaded file right to the computer on the network that requested it. It’s also able to serve as a dedicated network hub which allows network connected computers to transfer as well as share files. Based on theory, 802.11b hardware is able to transfer data up to speeds of 11Mbps, while 802.11g can deliver speeds up to 54Mbps, and 802.11n transfers up to 300Mbps. These download speeds are usually just one-third of the “standard’s” maximum data rate transfer speeds. Wireless access points are similar to a hub or a switch in that it will pass data information directly from a network router to other devices which are connected on the same network. They are different however since they’re able to transmit this data directly from a secure wireless router to the networked devices using Wi-Fi rather than a wired router which are connected to the network devices using cable Ethernet connections. Cat 5E will usually support data rate transfers of up to 1,000Mbps, which are also known or referred to as Gigabit Ethernet. Cat 6 cable are able to support even faster speeds, up to 10 Gigabit Ethernet. The extra overhead that’s provided by using a Cat 6 cable makes it ideal for using it on networks which has lots of traffic. A Cat 6 cable also has less noticeable noise than a Cat 5E cable. IPS is short for intrusion prevention system. An IPS device is able to monitor your network as well as all of its connected devices to prevent and block any malicious virtual attacks and viruses.